This article is about the number. For the year, see AD 3. For other uses, see 3 (disambiguation), III (disambiguation), and Number Three (disambiguation). Not to be confused with Ʒ (ezh), Ȝ (yogh), or З (ze). 3 (three) is a number, numeral, and glyph. It is the natural number following 2 and preceding 4. Three remains the largest number still written with the number of lines corresponding to the value (though the Ancient Romans usually wrote 4 as IIII, the subtractive notation IV became the preferred notation throughout and after the Middle Ages). To this day, 3 is written as three lines in Roman and Chinese numerals. This is also true regarding the Brahmin Indians' numerical notation. However, the path towards the modern glyph began with the Gupta, who modified the number through the addition of a curve on each line. Henceforth, the Nagari rotated the lines in a clockwise manner, and began ending each line with a slight downward stroke on the right. Eventually, these strokes were connected (as a result of ease, in a manner similar to cursive) with the lines below, and therefore rendered the number a glyph that possesses many similarities to the modern 3, albeit with an additional stroke at the bottom as ३. The Western Ghubar Arabs, however, possess the accomplishment of eliminating the additional stroke and hence creating the modern 3. While the shape of the 3 character has an ascender in most modern typefaces, in typefaces with text figures the character usually has a descender, as, for example, in . In some French text-figure typefaces, though, it has an ascender instead of a descender. A common variant of the digit three has a flat top, similar to the character Ʒ (ezh). This form is sometimes used to prevent people from fraudulently changing a three into an eight. It is usually found on UPC-A barcodes and standard 52-card decks. a rough approximation of π (3.1415...) and a very rough approximation of e (2.71828..) when doing quick estimates. the number of non-collinear points needed to determine a plane and a circle. the first odd prime number and the second smallest prime. the first Fermat prime (22n + 1). the first Mersenne prime (2n − 1). the second Sophie Germain prime. the second Mersenne prime exponent. the second factorial prime (2! + 1). the second triangular number. It is the only prime triangular number. the smallest number of sides that a simple (non-self-intersecting) polygon can have. Three is the only prime which is one less than a perfect square. Any other number which is n2 − 1 for some integer n is not prime, since it is (n − 1)(n + 1). This is true for 3 as well (with n = 2), but in this case the smaller factor is 1. If n is greater than 2, both n − 1 and n + 1 are greater than 1 so their product is not prime. A natural number is divisible by three if the sum of its digits in base 10 is divisible by 3. For example, the number 21 is divisible by three (3 times 7) and the sum of its digits is 2 + 1 = 3. Because of this, the reverse of any number that is divisible by three (or indeed, any permutation of its digits) is also divisible by three. For instance, 1368 and its reverse 8631 are both divisible by three (and so are 1386, 3168, 3186, 3618, etc.). See also Divisibility rule. This works in base 10 and in any positional numeral system whose base divided by three leaves a remainder of one (bases 4, 7, 10, etc.). Three of the five Platonic solids have triangular faces – the tetrahedron, the octahedron, and the icosahedron. Also, three of the five Platonic solids have vertices where three faces meet – the tetrahedron, the hexahedron (cube), and the dodecahedron. Furthermore, only three different types of polygons comprise the faces of the five Platonic solids – the triangle, the square, and the pentagon. There are only three distinct 4×4 panmagic squares. According to Pythagoras and the Pythagorean school, the number 3, which they called triad, is the noblest of all digits, as it is the only number to equal the sum of all the terms below it, and the only number whose sum with those below equals the product of them and itself. The trisection of the angle was one of the three famous problems of antiquity. Gauss proved that every integer is the sum of at most 3 triangular numbers. There is some evidence to suggest that early man may have used counting systems which consisted of "One, Two, Three" and thereafter "Many" to describe counting limits. Early peoples had a word to describe the quantities of one, two, and three but any quantity beyond was simply denoted as "Many". This is most likely based on the prevalence of this phenomenon among people in such disparate regions as the deep Amazon and Borneo jungles, where western civilization's explorers have historical records of their first encounters with these indigenous people. The Roman numeral III stands for giant star in the Yerkes spectral classification scheme. Three is the atomic number of lithium. Three is the ASCII code of "End of Text". Three is the number of dimensions that humans can perceive. Humans perceive the universe to have three spatial dimensions, but some theories, such as string theory, suggest there are more. The triangle, a polygon with three edges and three vertices, is the most stable physical shape. For this reason it is widely utilized in construction, engineering and design. The ability of the human eye to distinguish colors is based upon the varying sensitivity of different cells in the retina to light of different wavelengths. Humans being trichromatic, the retina contains three types of color receptor cells, or cones. In European alchemy, the three primes (Latin: tria prima) were salt ( ), sulfur ( ) and mercury ( ). The three doshas (weaknesses) and their antidotes are the basis of Ayurvedic medicine in India. Three is the symbolic representation for Mu, Augustus Le Plongeon's and James Churchward's lost continent. Philosophers such as Aquinas, Kant, Hegel, C. S. Peirce, and Karl Popper have made threefold divisions, or trichotomies, which have been important in their work. Hegel's dialectic of Thesis + Antithesis = Synthesis creates three-ness from two-ness. The threefold office of Christ is a Christian doctrine that Christ performs the functions of prophet, priest, and king. During the Agony in the Garden, Christ asked three times for the chalice to be taken from his lips. Jesus rose from the dead on the third day after his death (Sunday, April 9, 30 AD). The devil tempted Jesus three times. The Magi – wise men who were astronomers/astrologers from Persia – gave Jesus three gifts. There are three Synoptic Gospels and three epistles of John. Paul the Apostle went blind for three days after his conversion to Christianity. The prophet Balaam beat his donkey three times. In the Jewish mystical tradition of the Kabbalah, it is believed that the soul consists of three parts, with the highest being neshamah ("breath"), the middle being ruach ("wind" or "spirit") and the lowest being nefesh ("repose"). Sometimes the two elements of Chayah ("life" or "animal") and Yechidah ("unit") are additionally mentioned. In the Kabbalah, the Tree of Life (Hebrew: Etz ha-Chayim, עץ החיים) refers to a latter 3-pillar diagrammatic representation of its central mystical symbol, known as the 10 Sephirot. The Triple Bodhi (ways to understand the end of birth) are Budhu, Pasebudhu, and Mahaarahath. The Three Jewels, the three things that Buddhists take refuge in. The Imperial Regalia of Japan of the sword, mirror, and jewel. The Three Treasures (Chinese: 三寶; pinyin: sānbǎo; Wade–Giles: san-pao), the basic virtues in Taoism. Three Sovereigns: Heaven Fu Xi (Hand – Head – 3º Eye), Humanity Shen Nong (Unit 69), Hell Nüwa (Foot – Abdomen – Umbiculus). The Trimurti: Brahma the Creator, Vishnu the Preserver, and Shiva the Destroyer. The three Gunas found in Samkhya school of Hindu philosophy. The three paths to salvation in the Bhagavad Gita named Karma Yoga, Bhakti Yoga and Jnana Yoga. The three virtues of Humata, Hukhta and Huvarshta (Good Thoughts, Good Words and Good Deeds) are a basic tenet in Zoroastrianism. Three is a very significant number in Norse mythology, along with its powers 9 and 27. Prior to Ragnarök, there will be three hard winters without an intervening summer, the Fimbulwinter. Odin endured three hardships upon the World Tree in his quest for the runes: he hanged himself, wounded himself with a spear, and suffered from hunger and thirst. Bor had three sons, Odin, Vili, and Vé. The Wiccan Rule of Three. The Triple Goddess: Maiden, Mother, Crone; the three fates. The sons of Cronus: Zeus, Poseidon, and Hades. The Slavic god Triglav has three heads. The Theosophical Society has three conditions of membership. Gurdjieff's Three Centers and the Law of Three. Liber AL vel Legis, the central scripture of the religion of Thelema, consists of three chapters, corresponding to three divine narrators respectively: Nuit, Hadit and Ra-Hoor-Khuit. 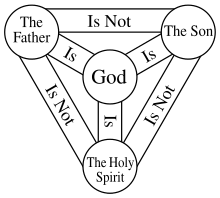 The Triple Greatness of Hermes Trismegistus is an important theme in Hermeticism. Three (三, formal writing: 叁, pinyin sān, Cantonese: saam1) is considered a good number in Chinese culture because it sounds like the word "alive" (生 pinyin shēng, Cantonese: saang1), compared to four (四, pinyin: sì, Cantonese: sei1), which sounds like the word "death" (死 pinyin sǐ, Cantonese: sei2). Counting to three is common in situations where a group of people wish to perform an action in synchrony: Now, on the count of three, everybody pull! Assuming the counter is proceeding at a uniform rate, the first two counts are necessary to establish the rate, and the count of "three" is predicted based on the timing of the "one" and "two" before it. Three is likely used instead of some other number because it requires the minimal amount counts while setting a rate. There is another superstition that it is unlucky to take a third light, that is, to be the third person to light a cigarette from the same match or lighter. This superstition is sometimes asserted to have originated among soldiers in the trenches of the First World War when a sniper might see the first light, take aim on the second and fire on the third. The phrase "Third time's the charm" refers to the superstition that after two failures in any endeavor, a third attempt is more likely to succeed. This is also sometimes seen in reverse, as in "third man [to do something, presumably forbidden] gets caught". Luck, especially bad luck, is often said to "come in threes". In American and Canadian football, a field goal is worth three points. For purposes of league standings, since the mid-1990s almost all leagues have awarded three points for a win. A team that wins three trophies in a season is said to have won a treble. A player who scores three goals in a match is said to have scored a hat-trick. A batter strikes out upon the third strike in any single batting appearance. Each team's half of an inning ends once the defense has recorded three outs (unless the home team has a walk-off hit in the ninth inning or any extra inning). In scorekeeping, "3" denotes the first baseman. Three points are awarded for a basket made from behind a designated arc on the floor. The "3 position" is the small forward. In bowling, three strikes bowled consecutively is known as a "turkey". In cricket, a bowler who is credited with dismissals of batsmen on three consecutive deliveries has achieved a "hat-trick". In Gaelic games (Gaelic football for men and women, hurling, and camogie), three points are awarded for a goal, scored when the ball passes underneath the crossbar and between the goal posts. Scoring three goals is called a "hat trick" (usually not hyphenated in North America). A team will typically have three forwards on the ice at any given time. In professional wrestling, a pin is when one holds the opponent's shoulders against the mat for a count of three. A successful penalty kick for goal or drop goal is worth three points. In the French variation of the bonus points system, a team receives a bonus point in the league standings if it wins a match while scoring at least three more tries than its opponent. The starting tighthead prop wears the jersey number 3. A "threepeat" is a term for winning three consecutive championships. A triathlon consists of three events: swimming, bicycling, and running. In many sports a competitor or team is said to win a Triple Crown if they win three particularly prestigious competitions. In volleyball, once the ball is served, teams are allowed to touch the ball three times before being required to return the ball to the other side of the court, with the definition of "touch" being slightly different between indoor and beach volleyball. ^ Gribbin, Mary; Gribbin, John R.; Edney, Ralph; Halliday, Nicholas (2003). Big numbers. Cambridge: Wizard. ISBN 1840464313. ^ "Most stable shape- triange". Maths in the city. Retrieved February 23, 2015. ^ Churchward, James (1931). "The Lost Continent of Mu – Symbols, Vignettes, Tableaux and Diagrams". Biblioteca Pleyades. Retrieved 2016-03-15. ^ "HUG 31, ff. 017r-v, inc. CF ad CE = CF ad CV". Codices Hugeniani Online. Retrieved 2019-03-07. ^ "Encyclopaedia Britannica". Lexikon des gesamten Buchwesens Online. Retrieved 2019-03-07. ^ Marcus, Rabbi Yossi (2015). "Why are many things in Judaism done three times?". Ask Moses. Retrieved 16 March 2015. ^ "Shabbat". Judaism 101. 2011. Retrieved 16 March 2015. ^ Kitov, Eliyahu (2015). "The Three Matzot". Chabad.org. Retrieved 16 March 2015. ^ Kaplan, Rabbi Aryeh (28 August 2004). "Judaism and Martyrdom". Aish.com. Retrieved 16 March 2015. ^ "The Basics of the Upsherin: A Boy's First Haircut". Chabad.org. 2015. Retrieved 16 March 2015. ^ "The Conversion Process". Center for Conversion to Judaism. Retrieved 16 March 2015. ^ Kaplan, Aryeh. "The Soul". Aish. From The Handbook of Jewish Thought (Vol. 2, Maznaim Publishing. Reprinted with permission.) September 4, 2004. Retrieved February 24, 2015. ^ See "bad" in the Oxford Dictionary of Phrase and Fable, 2006, via Encyclopedia.com. Look up three in Wiktionary, the free dictionary. Wikimedia Commons has media related to 3 (number). Grime, James. "3 is everywhere". Numberphile. Brady Haran. This page was last edited on 23 March 2019, at 17:04 (UTC).